After she's diagnosed with breast cancer, forty-nine-year-old Tess sets forth on a mission to complete her to-do list before, what she's sure is, her impending death. She needs to make peace with her estranged sister, Birdie, scatter her mother's long-kept ashes, rescue her daughter, Haddie, from the grip of an eating disorder, guide her teenage son, Henry, through a bumpy adolescence, and reignite the spark in her almost thirty-year marriage to her husband, Will. Tess is aided on her quest by narrator, Grace, who lends the story its most brilliant elements: subtle magical realism and deep psychological complexity. Is Grace an imaginary friend, guardian angel, or a part of Tess that knows better than she? 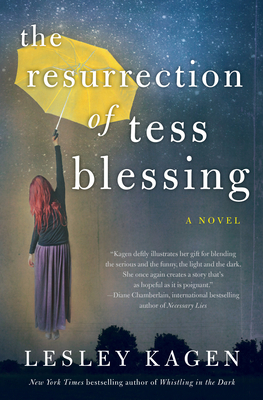 The Resurrection of Tess Blessing is by turns poignant, gritty, spiritually uplifting, and hilarious as hell. Lesley Kagen has created an unforgettable, redemptive story about a middle-aged woman with the odds stacked against her, who discovers that in the end, love really does conquer all. "Kagen deftly illustrates her gift for blending the serious and the funny, the light and the dark. With a touch of magical realism, she once again creates a story that is as hopeful as it is poignant." Kagen's talent shines in this wholly original and richly imagined story where unbearable heartache is softened with humor and a touch of magic."